Find answers to the most frequently asked questions, and help installing Greek fonts, retrieving forgotten passwords and more. 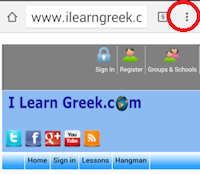 For help on how to use this site click: How to Use "I Learn Greek". After clicking the "Pay Now" button (yellow button) in I Learn Greek.com, you'll be transfer to PayPal's website to submit your payment securely. in the second screen you will fill your personal and Credit or Debit Card information. Click "Pay Now" and wait until the payment is processed. In the final screen click the button that says "Take Me to I Learn Greek.com"
This happens when you have a paypal account and your credit card is register with that account as payment method. If you do have a PayPal account but you want to pay with your credit card, do NOT choose the option "Don't Have a PayPal Account" in your payment screen. Instead login to your paypal account and find the link next to "Payment Methods" that says "Change". Click on the word "Change", choose your payment Method (ie. credit card) and continue with the payment process. If you do not have a paypal account then you should click the option "Don't Have a PayPal Account" and continue with the payment process. Don't forget when you finish paying to click the link on PayPal's site to take you back to I Learn Greek.com. Click "Pay for goods or services"
Type the subscription email shown in the image below and click "next"
Enter the dollar amount of the memebrship that you want. In the description/note field type the desired membership, i.e. 1 year subscription. Security Warning in IE "Do you want to view only the content that was delivered securely?" When you receive this error message, click Yes. In Internet Explorer, go to Tools, Internet Options, and click the Security tab. Make sure that in "Select a zone to view or change Security settings" that Internet is selected. Click Custom Level and scroll down about half way to "Miscellaneous" section. Click OK, Yes, and then OK again. PCI DSS Compliance. Is I Learn Greek complied? Payment Card Industry Data Security Standards (PCI DSS) are network security and business practice guidelines adopted by Visa, MasterCard, American Express, Discover Card, and JCB to establish a minimum security standard to protect customer’s payment card information. Is "I Learn Greek.com" complied? I learn Greek.com uses PayPal's Web Payments to process credit cards. We do not store credit card numbers in our databases. The process of this information is handled by PayPal. PayPal adheres to international PCI compliance standards for data security. Narration/Text to speach. Auto generated audio, players and how to use. I Learn Greek partnered with Linguatec to bring the latest technology in your fingertips. The new technology will enable you to hear narrated text in sections like Mythology. 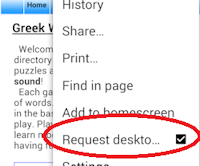 It will enable you to highlight a Greek word click read and hear the audio. Highlight and play audio is not working in mobile devices yet. Both players can be paused and restarted. In large body of text the system will highlight the sentence that currently is being played. The player should start automatically. If not please press the play button. 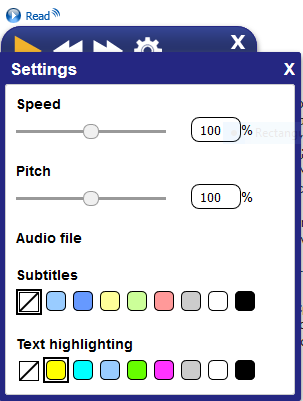 You can click on settings and change the speed, pitch, the highlight color and show/hide subtitles. Important: If you click on a single word and then you try to click on the compact player to start narration you will hear again the single word. This is a program glitch and we are working to fix it. Please reload the page and start your narration again. Our ILG Audio Player. What it does and how to use. Our audio player can be very helpful when you study. After you click on a file to play you can use the actual player to play, pause, stop or repeat the audio file you just played. The Player will not play unless you click on an audio link or a play button first. You can show or hide the player by clicking the button that says "show/hide player". Our Audio player is tested and works well with all major browser and all mobile devices. If the player does not work please update your browser to the latest version. We have recorded our sound files in MP3 format. The problem happens with Chrome and Firefox. Please follow the steps below to be able to play the audio. Then choose "Request Desktop Site"
I just paid with paypal but the website says: "Your account has expired"
Sign Off (Logout) by clicking the "Sign Off" or "Logout" link and then Sign In again. This will solve your problem. If the above solution does not solve your problem, empty your browser's cache and/or close your browser. I tried to register and I get the message "someone has already registered with that email address"
If you remember your Sign In (login) info, Sign in. You'll get a message that says "your membership has expired Renew". click and follow the screens. If you do not remember your login info you can retrieve your password with your email address. The site will "open" automatically when PayPal clears the check. You will receive a message from PayPal when the eCheck clears (3-5) days. I Learn Greek.com will be available right after that. We'll add the 3 days lost during the process within 24-48 hours after the echeck clears. If you forgot your password, please click Retrieve Password (instant when you remember the answer to the secret question) or Retrieve Password by email to go to the forgotten password page. You can also access this page when you enter your e-mail address at the Sign In page. Put any word as a password, and the system will show you a message. Click on the link on the message and this will take you to the "Retrieve password" page. Follow the prompts. Your User Name is the e-mail address that you provided when you registered. To retrieve it, go to Contact Us page and send us a message. We will email you back your secret question. Please reply with your answer. If you don't remember the secret question and answer, please provide any information you used during your registration. Please understand that we have to match some info or you will need to register again. That's why you should provide a real e-mail address during your registration. I'm logged in but I can not access the pages I want. Your session has timed out. Click the log out link and then login again. If you are a paid subscriber and you are taken to the "Login" or "Please Register" page when you login, please enable cookies in your browser. The ASP session needs the cookies enabled. This solution applies to the users that their account is currently active (paid). When you see this type of membership in our prices you can buy 1 year for yourself and 1 year for a person of your choice! Simply register and choose that membership. After you pay send us an email with your friends email, full name, address and telephone number. We'll create an account for your friend and email him/her, and you, his/hers login info. Click on the Apple logo in the upper-left corner of the screen and select System Preferences. Select International from the System Preferences screen. Make sure that Show input menu in menu bar is checked at the bottom of this screen. You can make the Keyboard Viewer viewable by checking the box. The Keyboard Viewer will enable you to see which keys on your keyboard input which letters in the language you select. Check the boxes next to the language you want available to you. In our case Greek. Click the flag icon (if you're in the U.S. it should be the U.S. flag) to bring up the Input Language Menu. Click on the language you want to type in. The flag will change to the country flag (in our case, Greek), and you'll be able to type in that language. In the Windows XP classic Start menu, click Start - Settings - Control Panel. Double-click Regional and Language Options . Click Add under "Installed Services", and then click the Greek and the keyboard layout you want to use for Greek. To configure the settings for the Language bar, click "Language Bar" under "Preferences". To configure the settings for switching between two or more languages click "Key Settings" under "Preferences". In the Windows Vista classic Start menu, click Start - Settings - Control Panel . Click the Keyboard and Languages tab, and then click Change Keyboard. Click Add under "General", and then click the Greek and the keyboard layout you want to use for Greek. To configure the settings for the Language bar, click "Language Bar". To configure the settings for switching between two or more languages click "Advanced Key Settings". 3. Press the Windows key + "x" and choose control panel. Click the "Add a Language" tab, choose Greek and then click Add. To switch between languages press Left Alt + Shift. Click on Language. If you do not see the applets in control panel type Language in the search box. Use Left Alt+Shift to switch between the English and Greek keyboards. To type an accented vowel, press the ';' key and then the vowel (separately). To use the dialitika ¨, press ':' before the vowel . To use dialitika with accent ΅, press SHIFT W or SHIFT " and then the vowel. To actually type ';' (the Greek question mark) and ':' (colon / Διπλή Τελεία) you need to press 'Q' and 'SHIFT-Q' respectively. Some Browsers will show odd characters when you hit the "Give me my score" button in the tests. To solve that, in the View menu, click Character Set and then Greek (windows-1253) or Greek (ISO-8859-7). To take advantage of all the features of this web site please download and install the latest version, of your favorite browser. We have developed a separate style for printing for this site. Now your prints will have larger font and look clearer. Make sure the scale is 100% in your printer. To do that choose Print - Properties - Layout - Scale By (percentage). The hangman game will work perfectly if you are using any modern browser. In some browsers, the Greek Characters might appear as strange symbols, in the text boxes. To solve that, in the View menu click Character Set and then Greek (windows-1253) or Greek (ISO-8859-7). To take advantage of all the features of this web site please download and install the latest version, of the browser that you prefer. The word search games are made with Oracle's Java. If the Word Search games don't work, or they delay, download the latest Java™ from Oracle's web site. What are RSS Feeds and XML? RSS (Real Simple Syndication or Rich Site Summary) is a format for syndicating news or content of sites. RSS aware programs are called news aggregators. A news aggregator can help you keep up with favorite weblogs or news by checking their RSS feeds.